I’m always on the lookout for innovative methods to secure sensitive data/information stored on the hard drive and USB drives. 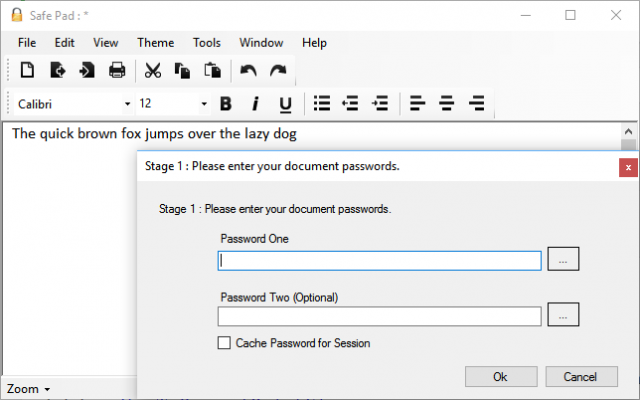 A few months back we published an article showing readers how to password protect sensitive data using any one of the free archive tools, you can catch up with that article here: How To Password Protect Files. 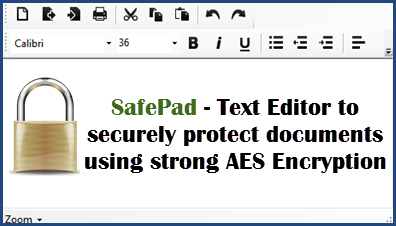 Recently, I came across SafePad, a simple text editor (similar to Notepad) which automatically encrypts all contained information. I can see multiple useful applications for this type of software: to store a list of account passwords, credit card or banking details– indeed, any sensitive or confidential information. SafePad is open source, free, and portable. Download is a mere 108kb zip folder and the software scans 100% clean through Virus Total. Simply extract the contents of the zip folder and run the extracted executable. SafePad encrypts your documents using the industry standard FIPS Compliant AES encryption algorithm (Advanced Encryption Standard). To protect your document you can provide 2 passwords (the 2nd password is optional). By using 2 passwords and performing multiple iterations of encryption, it makes it much harder to crack the passwords. If someone manages to crack password 1, all they will get back is encrypted text, so it would be very hard to them to know they have cracked that password. SafePad can also be used to to send sensitive information via eMail attachments, however, this function requires that the recipient must also have SafePad on hand in order to open/access the document. In this day and age, privacy and protecting sensitive information are paramount and, as I said earlier, I can see lots of situations where SafePad would be useful. However, it’s the sheer simplicity which really grabs me. SafePad is just so easy to use, plus it’s free, lightweight, and portable, what’s not to like!? Interesting little program. Not that it’s critical but I would like to know how strong the AES encryption is (he doesn’t say on his website). And I find it most annoying that whether you choose 1 or 2 passwords the program demands that you enter them twice — that’s fine as an option, but I don’t appreciate it as a requirement. Anyway, looks like he ended development on it as the last v1.3 update was over two years ago.